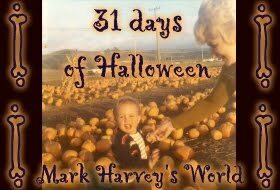 I started joining in on the Countdown to Halloween "virtual neighborhood" back in 2008 and I enjoy the self imposed pressure I put on myself to blog each day during October. After all, Autumn, October and Halloween = my favorite time of year! To read more about what John Rozum has put together - this virtual neighborhood to go trick or treating in - click here. And if you're up to the challenge (with no pressure mind you) of blogging every day about something Halloweenie, get in touch with John. He is a SUPER guy. Check Mark Harvey's World every day as I'll be dredging up whatever I can to keep you entertained. Never let it be said that "kids" leave my house on Halloween unfulfilled (oh my, the pressure).